OneWest Bank, the mortgage servicer previously owned by now-Treasury Secretary Steven Mnuchin, avoided numerous lawsuits and settlements that affected other banks after the 2010 foreclosure crisis, a Bloomberg BNA analysis showed. Compared with other banks, it was given a relatively light penalty during the Independent Foreclosure Review (IFR) by the Office of Thrift Supervision (OTS)—a 2011 review of potential foreclosure abuse by mortgage servicers that weren’t part of the National Mortgage Settlement. OneWest also avoided successful prosecution in class action lawsuits over foreclosure abuse, while numerous other banks entered into large-scale settlements. Also, a California state investigation into the bank was never filed “despite a strong recommendation” by the attorney general’s office according to a leaked memorandum from the attorney general’s office. David Dayen, an author and researcher on the foreclosure crisis, told Bloomberg BNA that the federal government’s response was weak for all banks involved in the foreclosure crisis, but that OneWest used numerous tactics to avoid scrutiny at the state and federal level. Homeowner advocacy groups such as the California Reinvestment Coalition repeatedly accused Mnuchin of running OneWest as a “foreclosure machine” for its actions during the foreclosure crisis, an allegation Mnuchin denied in his January 2017 confirmation hearings in Washington. The numerous complaints and details of voluminous foreclosures by the bank raise questions about whether the financial institution avoided penalties because it was innocent of foreclosure abuse or avoided censure by some other means. Representatives of legal aid and housing counseling organizations called OneWest one of the worst servicers they had dealt with in terms of abuses such as dual tracking—simultaneously pursuing foreclosure while negotiating loan modifications—and encouraging borrowers to default on their loans, during the 2015 hearings by the Office of the Comptroller of the Currency (OCC), over allowing OneWest to merge with CIT Bank. J.D. Power and Associates, a marketing and consumer survey organization, ranked OneWest the third-worst mortgage servicer in 2010 and fourth-worst in 2012. A Freedom of Information Act request made by the homeowner advocacy group California Reinvestment Coalition to the Department of Housing and Urban Development (HUD) showed that OneWest’s subsidiary, Financial Freedom, was responsible for 39 percent of foreclosures on reverse mortgages from 2009 to 2014, even though it only serviced 17 percent of all reverse mortgages. Based on that number, the bank foreclosed at three times the combined rate of every other reverse mortgage servicer. Mnuchin stated that HUD forced the bank to foreclose because of Federal Housing Administration (FHA) rules and that OneWest did whatever it could to provide mortgage adjustments to those in need. A representative from HUD did not respond to a request for comment about which regulation Mnuchin was referring to that would force a mortgage servicer to foreclose on a borrower. In 2015, HUD implemented a policy to move all past-due-tax and insurance-delinquent borrowers of reverse mortgages to a “due-and-payable category” to avoid the large costs that FHA was burdened with from past-due accounts. Numbers from the U.S. Treasury analyzed by Bloomberg BNA show that only one-quarter of Home Affordable Modification Program (HAMP) applicants for OneWest were approved, ranking the bank squarely in the middle of reviewed banks. Mnuchin also insisted that the bank never robo-signed documents and that the Department of Housing and Urban Development (HUD) often forced the bank to foreclose according to Federal Housing Administration (FHA) rules. In 2009, an employee for OneWest admitted to robo-signing documents—processing and signing more than 6,000 a week without knowing their contents and without the presence of a notary— in a deposition for a case involving the bank. Sandy Jolley, a reverse mortgage suitability and abuse consultant who testified at the hearings, contested Mnuchin’s statements about HUD to Bloomberg BNA. “HUD doesn’t have the system or structure in place to enforce, regulate or audit these rights and protections; the servicer is 100 percent in control of the servicing and foreclosure, not HUD,” she said. Neither a representative for CIT Group, which bought OneWest in August 2015 nor HUD responded to a request for comment. OneWest was not included in the National Mortgage Servicer Settlements, which investigated banks for foreclosure abuse allegations, such as signing foreclosure documents without an notary present or confirming that their contents were accurate. Instead, it was part of a similar Independent Foreclosure Review (IFR) by the Treasury’s Office of Thrift Supervision (OTS) with only a minimal penalty as a result. The IFR focused on identifying borrowers who might have been harmed by errors or misrepresentations in foreclosure documents. OneWest was one of the few banks to complete the IFR process, but it did so on its own, without oversight by OTS. 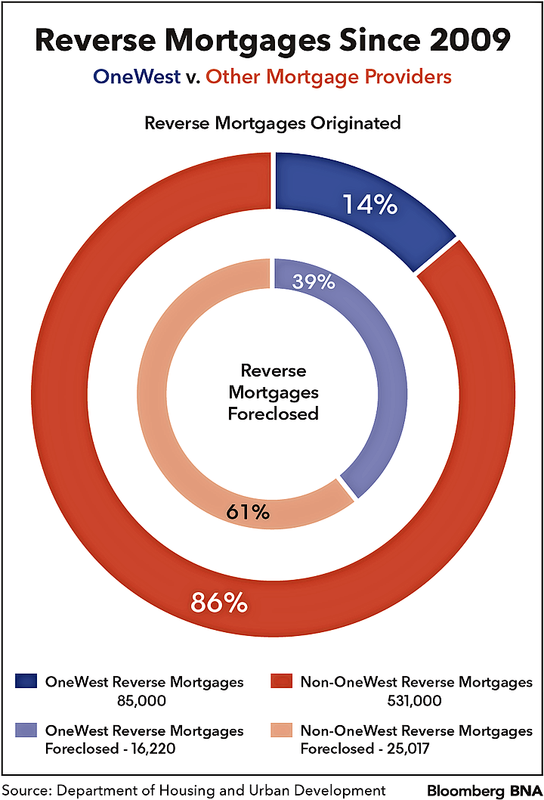 The IFR forced most banks to pay back from $2,000 to $3,000 per in-scope borrower, on average. For OneWest, it was $44 per borrower on average and only 5 percent of borrowers were due remediation. 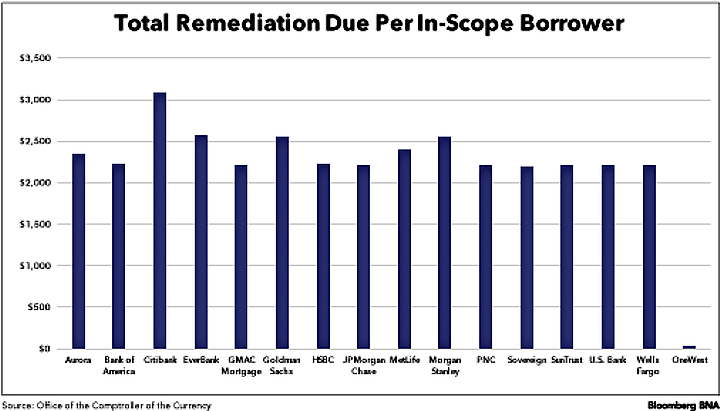 All other banks paid out between $84 million to $2.9 billion in total remediation, OneWest paid out only $8 million. A representative for the U.S. Treasury’s Office of the Comptroller of the Currency, which the OTS is now a part of, declined to comment for this story. The OTS investigation was eventually described as highly flawed in a 2013 Government Accountability Office report, which took it to task for poor organization and an inability to identify an exhaustive number of harmed borrowers. Internal Bank of America documents obtained by ProPublica showed that the IFR investigators relied on the banks for their research, tainting the investigation. David Dayen, an author and researcher on the foreclosure crisis, told Bloomberg BNA that the IFR investigation was weak across the board, previously referring to it as “neither independent nor a review,” and said that OneWest used numerous tactics to avoid scrutiny at the state and federal level. “They were clearly very aggressive when it came to investigations into their practices,” he said, but he also added that most banks escaped the foreclosure crisis relatively unharmed. OneWest has been a party to hundreds of lawsuits related to foreclosure activity since the foreclosure crisis, but all of them were dismissed or settled out of court, according to an analysis by Bloomberg BNA. OneWest sold most of their servicing portfolio to Ocwen Financial Corp., shortly after the California Homeowner’s Bill of Rights (HBOR) took effect in January 2013, according to Sean Coffey with the California Reinvestment Coalition. Coffey said he believes that OneWest may have avoided legal scrutiny of its practice by appealing to federal preemption—in which because of the bank’s status as a federally chartered institution, federal laws preempted any state laws. OneWest successfully used preemption to avoid class action lawsuits on force-placed insurance abuse, but a 2016 appeal to preemption in the case Boyle v. Vesuvio Holdings, Cal., S237962 to avoid prosecution under HBOR failed. The case is ongoing. No actions were brought by the Consumer Finance Protection Bureau (CFPB), based on an analysis of legal cases and press releases from the agency by Bloomberg BNA. A representative of the agency didn’t respond to a request for comment to confirm that the agency hadn’t brought a case against the bank. Few complaints against OneWest appear in CFPB’s consumer complaints database, according to an analysis by Bloomberg BNA. Out of 1,600 complaints for OneWest’s current parent company, CIT Group, only 17 refer specifically to OneWest and 29 refer to Financial Freedom, OneWest’s reverse mortgage arm. CFPB also only started accepting complaints in 2011, after most of the foreclosure crisis had already passed, Brian Simmonds Marshall, policy counsel at Americans for Financial Reform, told Bloomberg BNA . Kevin Stein indicated that the CFPB database may not be relevant here since most issues with OneWest would be about their reverse mortgage subsidiary, Financial Freedom. Because reverse mortgage borrowers are always seniors, they are less likely to file complaints, according to Stein, because they would be unfamiliar with the database. But Stein also believes that HUD has many more complaints than CFPB. A response to a Freedom of Information Act Request by California Reinvestment Coalition from HUD indicated that it would take hundreds of hours to complete the research to find all of the complaints against Financial Freedom.